After the disappointment of 2001, Isle of Man race organisers are pulling out all the stops with the intention of making 2002 the best TT. Jefferies will ride a V&M R1, Moodie, like McGuinness is likely to race a Honda FireBlade while Rutter has yet to confirm his ride but has pledged his interest in returning to the Island. Jefferies won three of the TT races in 2000 – including the Senior on the V&M R1 when he set a new outright lap record of 125.69mph. He said: " It’s great news. I really missed not doing the TT this year and now the British superbike dates have been shuffled it means I can look forward to a great scrap with McGuinness and co. "
The festival-ending Senior TT clashes with the World Supersport round in Germany, which means Honda bosses are putting all their resources into the Formula One race. Two-time TT winner McGuinness rode his TT Blade to victory at Macau in November. 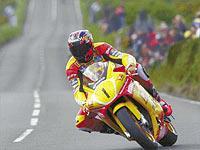 He said: " I’ve never won one of the big TT races and the Blade will provide me with the opportunity. " Moodie’s Yamaha World Supersport contract allows him to take other rides outside the series, on any machinery he chooses providing there’s no clash. That means potential rides at the North West 200 and TT. He said: " I want my TT lap record back and there’s a couple of exciting options on offer right now for me. There is a chance of riding a Honda again but I’ve also been offered 500cc V-four two-stroke GP bike to ride. It’s a long time since a two-stroke 500 won a TT race. " Rutter still has to finalise his 2002 British superbike plans but said: " I’d love to do the TT but it all depends on which team I finally hook up with. "